In July 2018, as Ilhan Omar was running for Congress, the rapidly rising Minneapolis DFLer suddenly faced questions about money she was paid to give speeches at community colleges while she served on a higher-education finance committee as a state legislator. 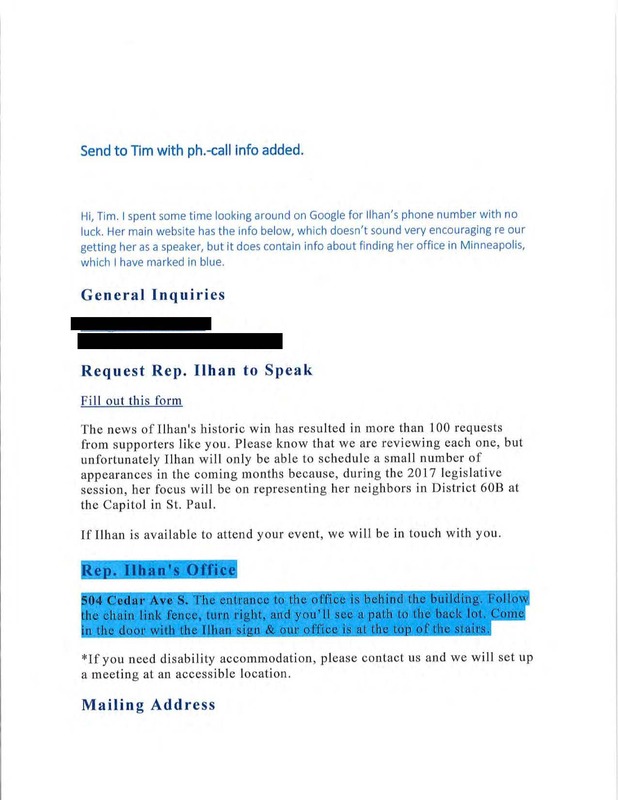 Though Omar returned the money, claiming the speeches were booked before she was elected to the Minnesota House, new documents provide context for one of the episodes – a $500 honorarium Omar was paid to give a speech in April 2017 at Inver Hills Community College. 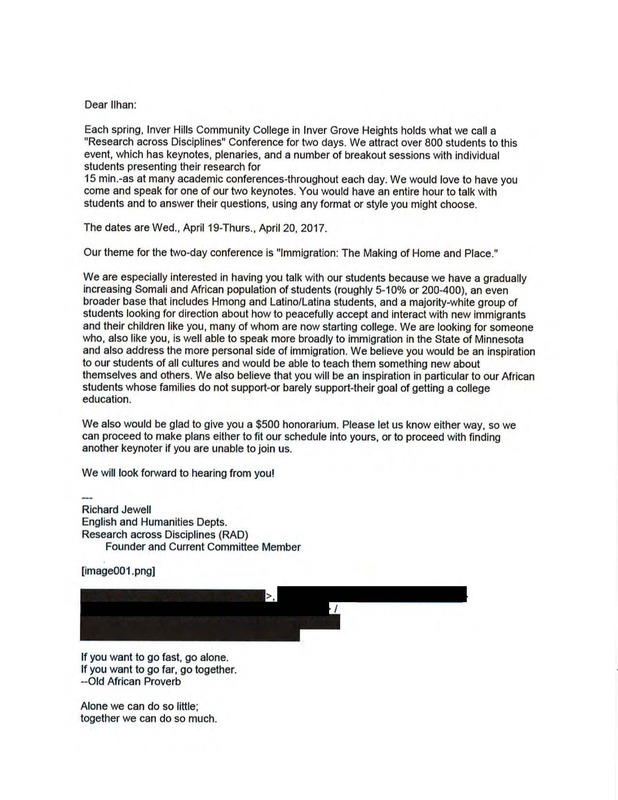 The documents, obtained by Public Record Media, a nonprofit based in St. Paul, show that school officials considered asking Omar to instead donate the honorarium to the community college’s foundation and were confused whether she should be considered a state employee or could even accept the money. 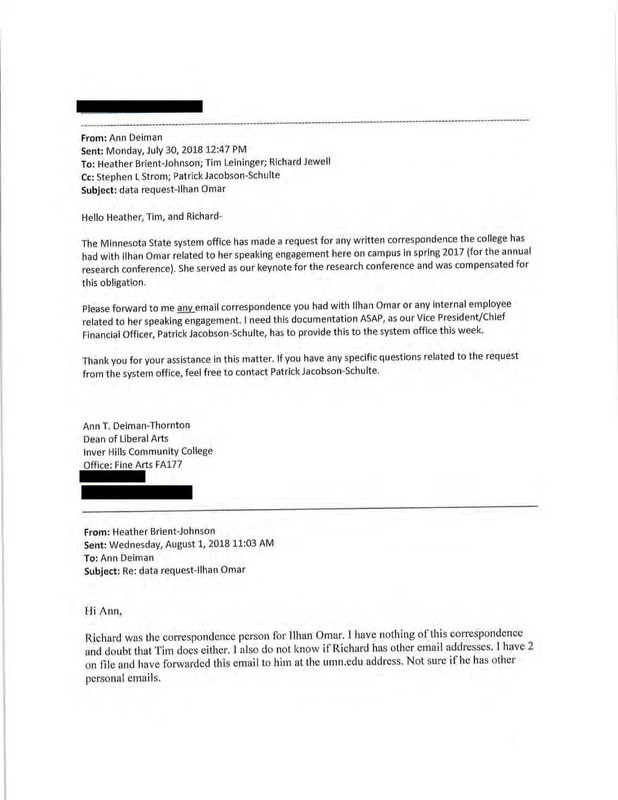 But internal emails indicate that Omar’s office did not see accepting the money as a problem – and at one point asked the school why Omar had not yet been paid. The school, as part of the Minnesota state system of public colleges, seeks money from the Legislature. Omar, as a state legislator at the time, sat on the House Higher Education and Career Readiness Policy and Finance Committee. “Rep. Omar asked me to follow up. 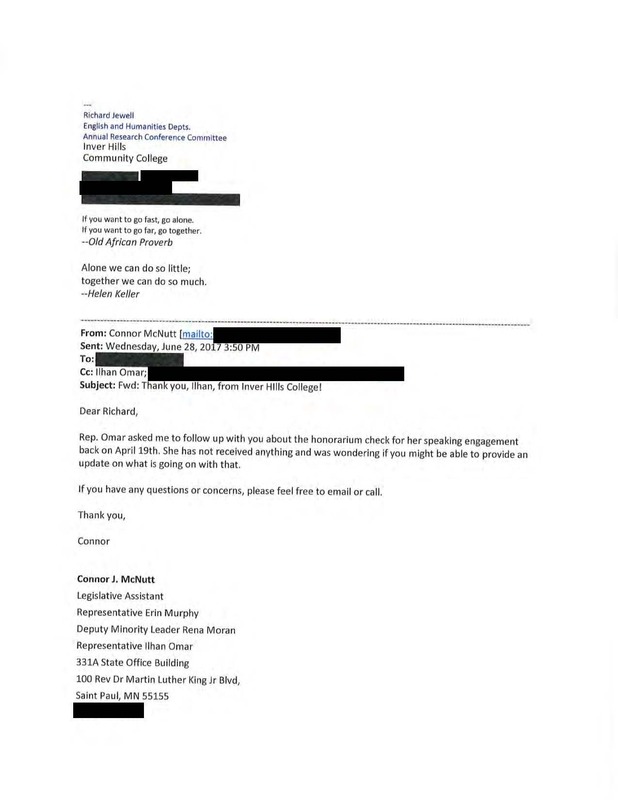 [She] has not received anything and was wondering if you might be able to provide an update on what is going on with that,” Connor McNutt, a legislative assistant to Omar, wrote to the school in a June 2017 email. Her speech at the college came three months after she became the first Somali-American member of the Minnesota Legislature, and four months after the Minnesota House held orientation sessions for new members that included a discussion of ethics rules. Now a member of the U.S. House, Omar has continued to make headlines. Since taking office in January as one of the first Muslim women ever elected to Congress, Omar has issued an apology for remarks House Speaker Nancy Pelosi and others said were anti-Semitic and has publicly clashed with President Trump, who has said Omar should resign. The records obtained by PRM go back to just before and after she was elected to the state Legislature in 2016. 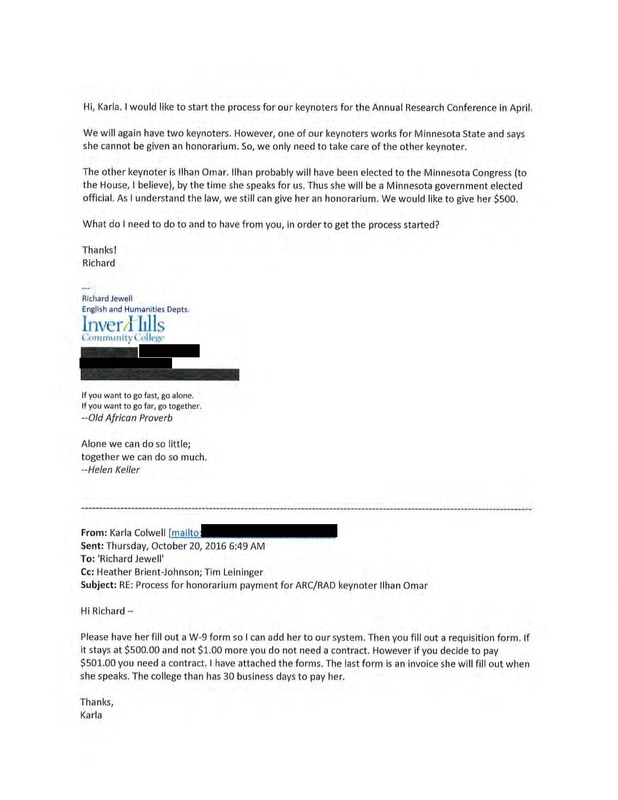 Omar was confronted over the $500 honorarium – and another $2,000 speaking fee she accepted from Normandale Community College — by a Republican legislator in July 2018 who said she violated Minnesota House rules for accepting money from entities that had business before the Legislature. Omar has also faced other issues. Her campaign paid a late filing fee in 2017 related to a campaign finance report. And state Rep. Steve Drazkowski, the Republican who publicly criticized Omar’s speaking honorariums, also said that Omar separately violated state law by using $2,000 in campaign money to pay a law office that specializes in divorce law. Though a lawyer from the firm represented Omar in a divorce case, the lawyer was quoted in media reports stating that the money was used for crisis management consulting related to Omar’s 2016 election campaign. Omar said the speaking engagements had been scheduled before she was elected to the Minnesota House in November 2016. “A number of speaking engagements, including these, were scheduled and confirmed prior to my election, swearing-in, and instruction on Minnesota House rules. In the transition, we didn’t realize that we would need to look back and apply these rules to previously confirmed engagements,” Omar said in response. But according to records obtained by PRM, Omar was not given the money until several months after she had taken office and after new Minnesota House members were briefed on ethics issues. Even before her election in 2016, officials at Inver Hills were eager to take advantage of Omar’s emerging popularity – one school official said she “probably” would soon be elected to the Minnesota House — and have her speak at the school. “We are looking for personal stories of immigration and their successes. We decided that she would be great for this,” Heather Brient-Johnson, of the school’s biology department, said in a September 2016 email. (School records indicated that a second speaker at the conference told the school she could not accept the honorarium). But three months later – after Omar’s election to the Minnesota Legislature – there were doubts Omar would make the speech because the school could not reach her. 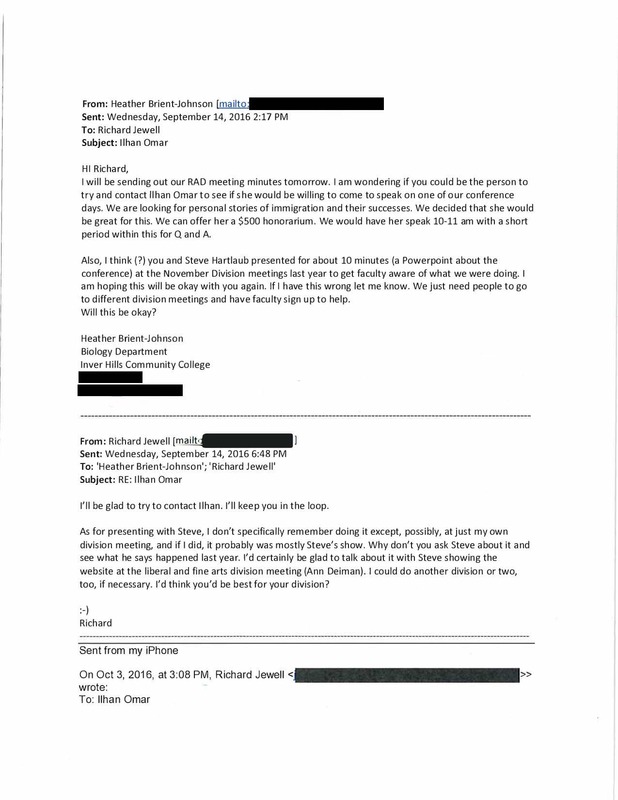 As the day for Omar’s speech in April 2017 approached, documents show that school officials continued to have trouble reaching Omar’s office. 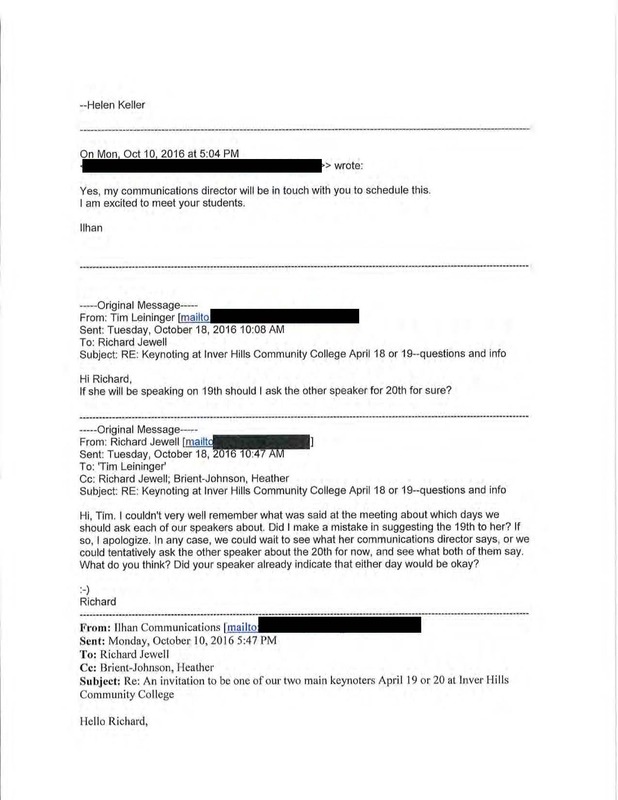 “Please get the W-9 [form filled out by Omar] to me ASAP as this event is in 2 weeks,” Karla Colwell, a school official, wrote on April 5 to Richard Jewell of the school’s English and Humanities Departments. “Rep. Omar’s communications department is very slow in responding. We’ve been working for many weeks to get this info,” Jewell responded the same day. Jewell had made the school’s initial offer to Omar in October 2016. Before Omar’s election in 2016, school officials had discussed asking Omar to forgo the $500 honorarium and donate the fee back to the school’s foundation for scholarships – particularly if she was barred from accepting the money. 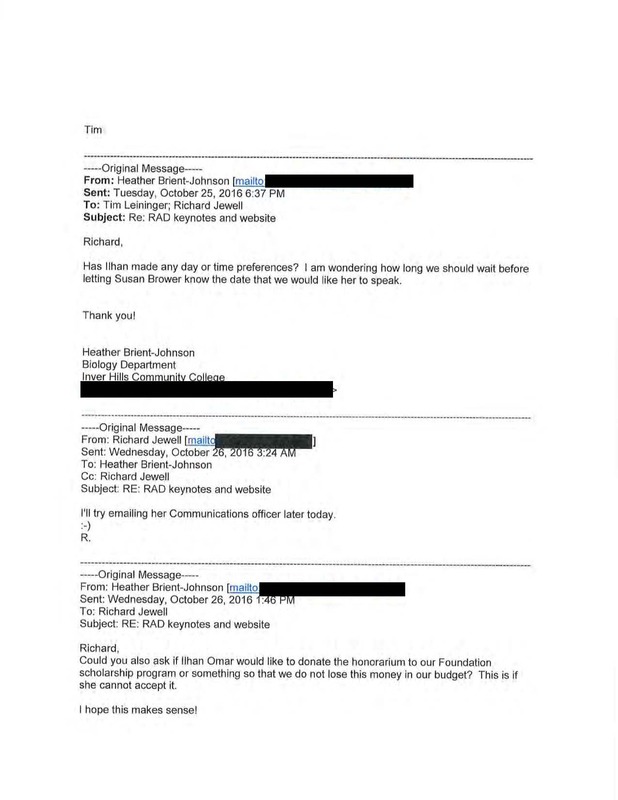 “Could you also ask if Ilhan Omar would like to donate the honorarium to our Foundation scholarship program or something so that we do not lose this money in our budget? This is if she cannot accept it,” Brient-Johnson wrote in an Oct. 26 email to Jewell. “Will do,” Jewell replied. But he suggested waiting until after the November 2016 elections because Omar’s office would likely be busy. Documents provided to PRM did not show whether the school followed through with the request. Other e-mails showed school officials continued to debate whether Omar could receive the money. “As I understand the law, we can still give her an honorarium,” Jewell wrote in an October 2016 email. The documents do not give details on what precisely was covered, or which legislators attended. The records from Inver Hills meanwhile showed that school officials were also confused whether Omar should be considered a state employee. “Representative Omar is a Minn. State House Representative. 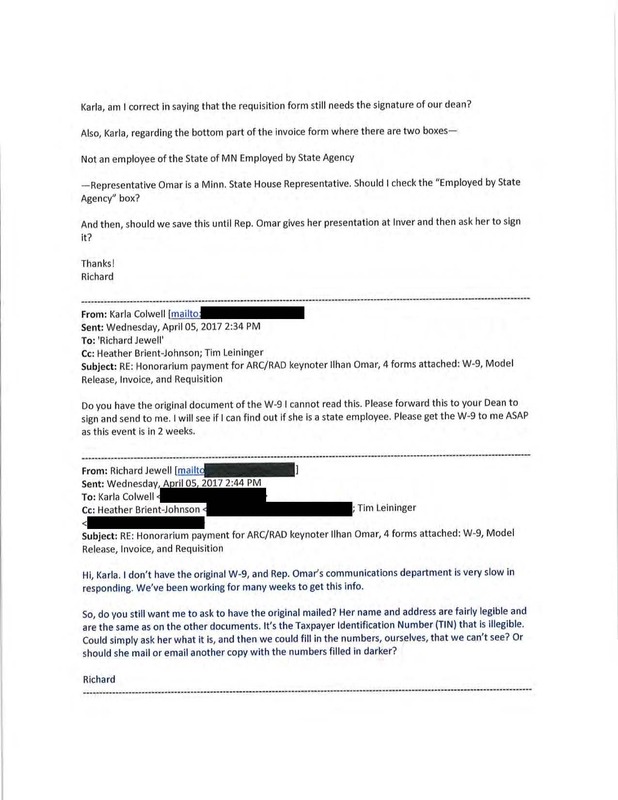 Should I check the ‘Employed by State Agency’ box?” Jewell asked a school official in an April 2017 e-mail. “I will see if I can find out if she is a state employee,” Colwell responded. After Omar’s speech, Jewell wrote a congratulatory note to the state legislator. 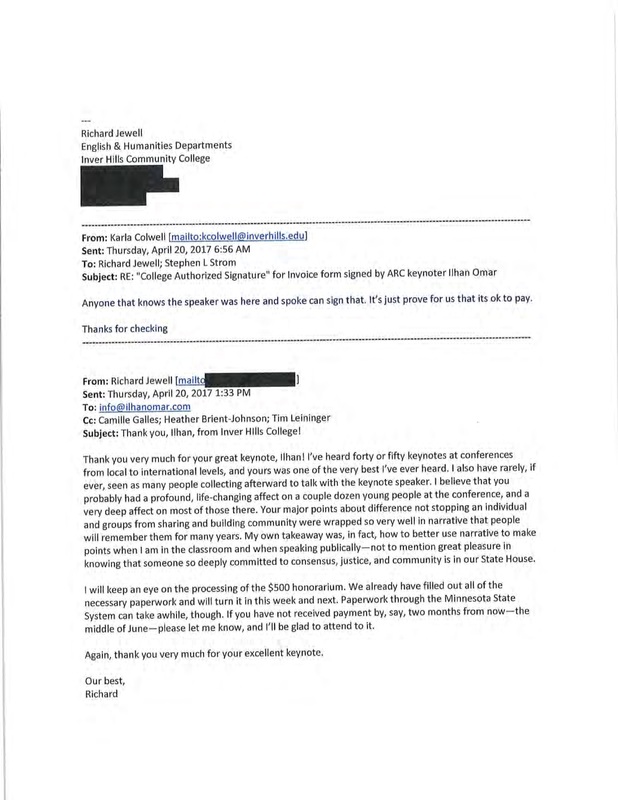 A year later, the speech – and the honorarium – would send state higher education officials scrambling as questions were raised about the payment. A month after Deiman-Thornton’s email, according to records provided by the school, Omar returned the money.